“Oh, there’s plenty of fish in the sea”. Well, it really turns out there isn’t. Between my job working with penguins (who often come into rehabilitation for malnutrition) and research I have done for my degree, I have realised that the above affirmation is quite the white lie. Most people (even those who eat animal products) tend to agree that farming is environmentally detrimental on many levels, however there is an undeniable belief that fishing is acceptable because the animals are not being farmed – they are in their natural environment, and allowed to flourish, right? That’s a beautiful idea, but unfortunately it’s not the case at all. One of the research papers I recently completed was about the criminal theory of environmental crimes in New Zealand. I am not going to bore you with the specifics of criminological study, but I would like to share some of the information I have come across. Illegal, unreported and unregulated (IUU) fishing is known to occur in all the world’s oceans, and it is estimated that total global annual loss is anywhere between $10-23 billion USD (Agnew et al. 2009; Liddick 2014). Fish dumping, otherwise known as high grading is an illegitimate practice in which only large, high quality fish are kept aboard and reported whilst undesirable fish are discarded, increasing profitability of hauls (Liddick 2014). In New Zealand in recent years, there has been increased awareness of this practice, due mostly in part to two Ministry of Primary Industry (MPI) reports which were leaked. Another report was penned by the Queen’s Counsellor, known as the Heron report, and top-level scientists have compiled data from the three reports. Dr Glenn Simmons and his colleagues’ findings were shocking, to say the least. It was established that the “total amount of marine fish caught… [is] 2.7 times more than official statistics”, and the majority of this difference is “unreported commercial catch and discarded fish” (Simmons et al. 2016). They also explain that one of the MPI reports found 20-100% of quota fish are discarded per haul. In fact, since the 1950s, in excess of 14.7 million tonnes of catch has been dumped at sea. On top of the blatant disregard for animals as victims, the webs of lies and mismanagement, and the monetary loss, fish dumping is environmentally extremely serious. Excessive amounts of decaying fish can smother the benthos, cause nutrient blooms and oxygen depletion, leading to ocean dead zones. Human health may thus be directly impacted, due to the movement of diseases, as a result of large-scale decomposition, through the food chain, on to human dinner plates. Furthermore, the future health of our fisheries are totally undermined by illegal practices such as fish dumping. It was estimated, that as of 2009, a minimum of 15% of New Zealand’s fish stocks were depleted. Worldwide, 52% of major stock species are fully exploited, a further 6% are depleted and at this rate, most large fish stocks will collapse by 2048 (Petrossian 2014). 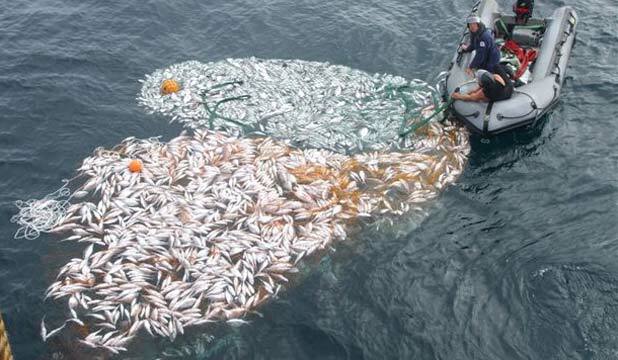 And despite all this, dumped fish is estimated to be worth at least 25% of total worldwide catch. In the short term, official fish stock statistics are inaccurate, which, in the long term could lead to an ecological tipping point or complete extinction of many of the species in our oceans. Then what? We will lose a major source of global protein, food security and the livelihoods of those in coastal populations will become dire, not to mention, the flow-on effect from such a large scale marine disaster could detrimentally affect the earth’s environment. New Zealand has one of the largest Exclusive Economic Zones in the world, at 1.3 million square nautical miles, which does make it pretty tricky to patrol. Under the New Zealand system there are rules and regulations, but despite this, vessels are selectively choosing the most valuable catches to bring back to land, and are throwing anything else overboard. More dishearteningly, many of the men working on fisheries vessels are not comfortable doctoring data or discarding fish, but are forced to do so by the company owners, yet feel unable to speak up because they risk being fired, losing quota or losing their livelihoods. Simmons said during an interview with Radio New Zealand that fishermen have “basically become criminals because they’re forced to go out there with shopping lists. They don’t want to be doing what they’re doing”. Unfortunately, as resources become scarcer, profitability rises, further increasing demand and levels of illegal behaviour within the industry. What I find most disturbing is that the government is clearly aware of the illegal industry activities. In fact, Director of Fisheries Management, David Turner was quoted saying that if the government were to stop fish dumping, “over half of the inshore fleet [would be] out of business overnight” (Macindoe 2017). Wait, what? Maybe the most pertinent quote I found was this: “the systemic pressures associated with the global capitalist mode of production inevitably lead to… exploitation of human beings, ecosystems and species” (Barak 2015). Within capitalism, nature has become a commodity which can be monopolised on, in order to increase the riches of capitalist, regardless of social or environmental outcomes, and that, in my opinion, is the root of all our current environmental issues. At the core of many environmental conundrum is a public and “political culture which takes for granted, but rarely sees as problematic, the proposition that continued expansion of material consumption is not only possible ad infinitum but will not harm the biosphere in any fundamental way” (Barak 2015). Unfortunately, it is very obvious gross breaches of fishing laws are occurring, yet New Zealand’s, and the world’s, social and political climate is facilitating fish dumping, allowing it to continue undetected, unabated and minimally prosecuted. The question then, is what can we do, as morally conscious citizens? Personally, I do not eat any animal products. However, I am aware that not everyone is ready for this step – so boycott unsustainable fishing corporations, put pressure of fishing companies to be more transparent with catch data, and maybe most importantly demand that your government takes seriously, and prosecutes any or all unlawful fisheries activity. This is a just a tiny snippet of a massive black-hole of abhorrent behaviour occurring in the world’s seas, so I implore you, go out there yourself and learn as much as you can about what we, as human beings, are doing to our incredible planet. Agnew, D., Pearce, J., Pramod, G., Peatman, T., Watson, R., Beddington, J. and Pitcher, T. (2009). Estimating the Worldwide Extent of Illegal Fishing. PLoS ONE, 4(2), pp. 1-5. Available from: DOI 10.1371/journal.pone.0004570. Barak, G. (2015). The Routledge International Handbook of the Crimes of the Powerful. Hoboken: Taylor and Francis. Liddick, D. (2014). The Dimensions of a Transnational Crime Problem: The Case of IUU Fishing. Trends in Organized Crime, 17(4), pp. 290-312. Available from: DOI 10.1007/s12117-014-9228-6.